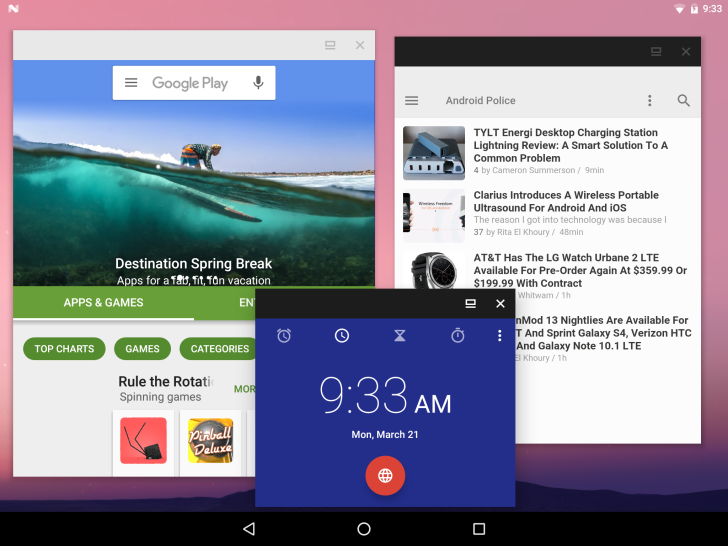 Android N is introducing multi-window support in a limited way. A split-screen option sits apps side-by-side, so you can see more than one at once. But if you want to resize and drag windows like you would on a PC, it can be done, but it takes a bit more work. We didn't expect to see freeform multi-window support in the upcoming version of Android, but it would be nice to see the feature appear as an optional flag. That won't happen either. Android Developer Advocate Ian Lake has stated that the APIs are public and accessible, so manufacturers can choose to enable the feature if they wish — but they won't be enabled on any Nexus devices. The Pixel C won't get any love either. This news comes as Google provides app developers with more information and guidelines on how to prepare their apps for multi-window. Check out the video, and if you'd like to go more in-depth, hit up the source link.